Santa Monica is the epitome of a Southern California beach town with its surfable waves, walkable downtown, laid-back atmosphere, and seaside amusements. Santa Monica makes for a family-friendly weekend getaway, with just enough to see and do in a couple of days without being overwhelmed by the need to squeeze it all in. When I asked readers where my family should go for a weekend getaway, 55% of voters chose Santa Monica. This Southern California beach town is probably best-known for the Santa Monica Pier and its amusement park, Pacific Park, which offers 11 rides including a roller coaster, a handful of fast food options, and carnival games galore. There is something so summery, retro, and joyous about taking a spin on a Ferris wheel on a pier perched over the ocean! There is no entrance fee to the park. You can purchase individual ride tickets or serious ride lovers can purchase an all-day wristband for unlimited fun. 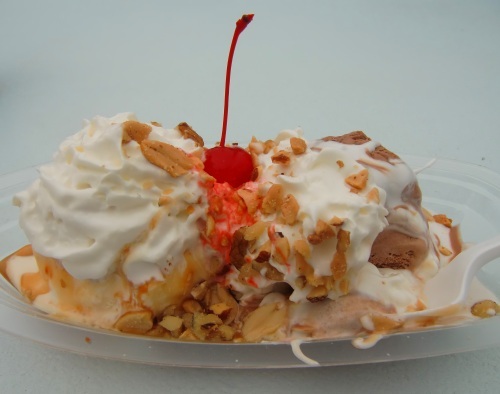 After taking in a few rides, head over to the Soda Jerks Fountain Service for hand-dipped ice cream sundaes. This ice cream parlor, also located on the pier, has limited counter seating inside (next to the indoor carousel) plus outdoor tables at which to gobble up your goodies. Choose from old school favorites like an egg cream or go for Curious George’s Jungle Shake (a blend of vanilla ice cream, chocolate syrup, mixed nuts, and banana). Or, you can create your own sundae from 16 flavors of ice creams, sherbets, and sorbets plus nine toppings. The salted nuts on top were the bee’s knees! Santa Monica Pier offers a variety of sit-down restaurants, a handful of shops, and an aquarium. The Santa Monica Aquarium may be the smallest aquarium I have ever visited but it is a non-profit and admission fees are minimal. 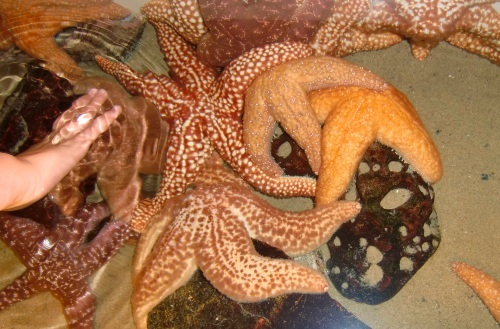 My five-year-old enjoyed creating a paper shark puppet while her toddler younger brother gazed at the tanks of fish and got a chance to pet a sea star. Once you tire of the pier, walk over to the Third Street Promenade, a 30-block pedestrian-friendly shopping area. There is no shortage of retail stores or dining options here! Adding to the fun are street performers singing, dancing, doing acrobatics, and playing musical instruments of all kinds. This free (or tip-only) entertainment enabled me to snag a couple of new shirts and a darling sweater from H&M while the hubs minded the kids! 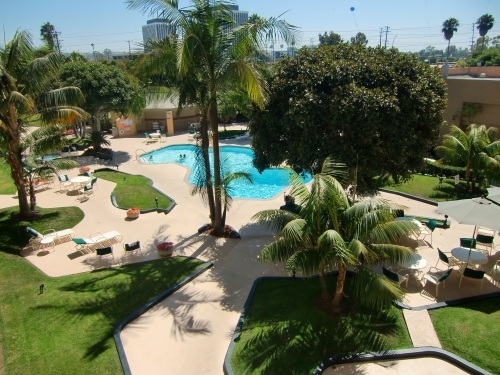 We stayed just outside Santa Monica at the Los Angeles Marina del Rey Courtyard by Marriott. Our room was a little cramped for a family of four, but the service was friendly, the hotel was clean, and the outdoor pool surrounded by palm trees was a pleasant diversion for big sister Karissa while toddler Leo took his afternoon nap. I appreciated the subtle little extras this hotel provided, including individually packaged earplugs (for those of us married to a snorer) and self-service poolside ice water. I was a bit surprised when my bill for the buffet breakfast arrived. I thought breakfast was included at Courtyard hotels. (Alas, I must’ve been thinking of Comfort Inn.) Although a free breakfast would have certainly been preferred, we enjoyed a pleasant spread of fresh fruit, yogurt, cereals, juices, coffee, make-your-own waffles, and an omelet station. One of the most memorable aspects of our trip for me was meeting former Travel Mamas Guest Blogger Debi Huang. She is the author of Go Explore Nature, a blog that suggest unique ways and fun places to explore the outdoors with kids. 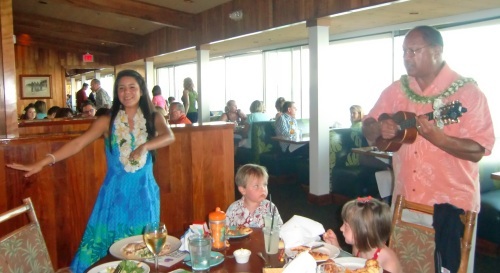 On our first night in town, she and her husband, their two boys, and my brood got together at Duke’s Malibu for some scrumptious fresh fish, live ukulele music with hula dancing entertainment, and a gorgeous view of the ocean. The best part for me was gabbing about the wild and wacky world of blogging with Debi while our husbands wrangled the children! A wonderful bonus to blogging is all of the incredible people I have met from around the country and around the world who share my love of writing and travel. What a wonderful way to connect with locals wherever I go! 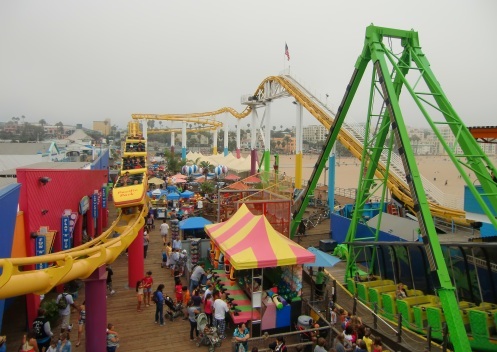 While it was too chilly for a beach outing during our Labor Day vacation to Santa Monica, we did zip around on amusement park rides, play carnival games, eat some tasty food, and meet up with some awesome Santa Monica residents. What more could we ask for? What’s your favorite attraction, restaurant, or hotel in Santa Monica? Let us know in the comments! 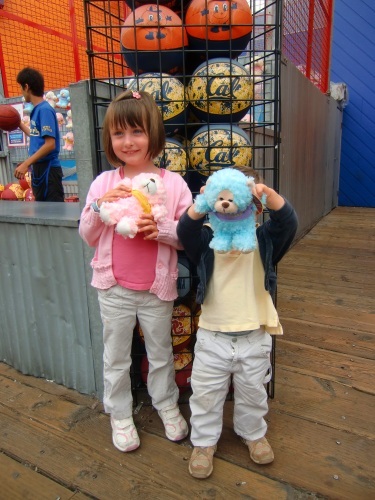 A note from the Travel Mama: The Santa Monica tourism board welcomed my family with a beach bag of logo items and two free Pacific Park wristbands. 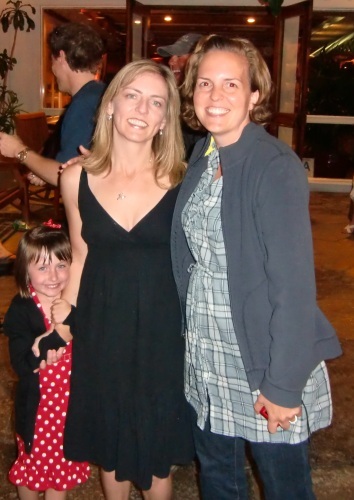 We paid for much of our two-night hotel bill with a $250 Marriott gift card, which I earned for hosting an unrelated post on Travel Mamas. These benefits did not affect my opinion of anything mentioned in this story. I will always let you know if I receive any any products or services related to a blog post. It looks like you guys had a great time. I’m glad to see you visited the aquarium on the pier. It’s an often overlooked, yet great option for the little ones. 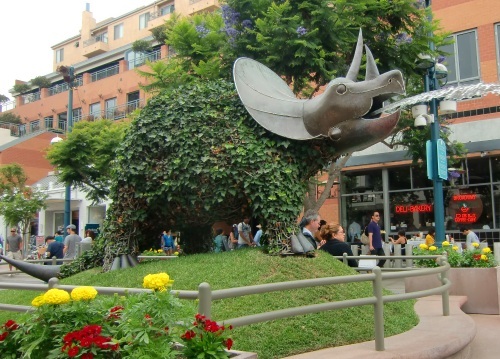 And my kids LOVE the dinosaurs spouting water on the Third Street Promenade. My kids still talked about the bike ride we did from Santa Monica beach to Venice beach. We only had a day there so we knew it’s a place we would want to come back to visit again. We have stayed in the past at the Sheraton Delfina in Santa Monica. The lobby is a bit swanky and the rooms are nice (for Sheraton standards) although they seem to be stepping it up a bit in the bed/bedding and trying to catch up to the Westin. They have a free shuttle to and from the surrounding area (within a certain radius and easily the pier, beach, and 3rd street promenade). We also walked to the pier which took about 10 min. (At least) one side of the hotel has balconies and ocean views and there is a little convenience store half a block away which helped us in the milk and snacks department. Santa Monica is just beautiful. I would visit that city as many times as I could. It has a subtle vivaciousness in a gorgeous setting that makes it desirable to come back to. I love their wide and endless beach along with the expansive, entertaining promenade. Great place to go when you are so close since we live in San Diego! Hieee! I will do this totally with the first kid I get. Thanks for the post! Looks like you and your little ones had a wonderful time! My family and I went a few months back and loved it! We rented out one of the santa monica vacation rentals down by the pier. It was the perfect location since it was not only close to the beach but it allowed the kids to go to the pier as much as they wanted.